A constant creature of the TRACC house reef the moray eel is often hidden and often seen. 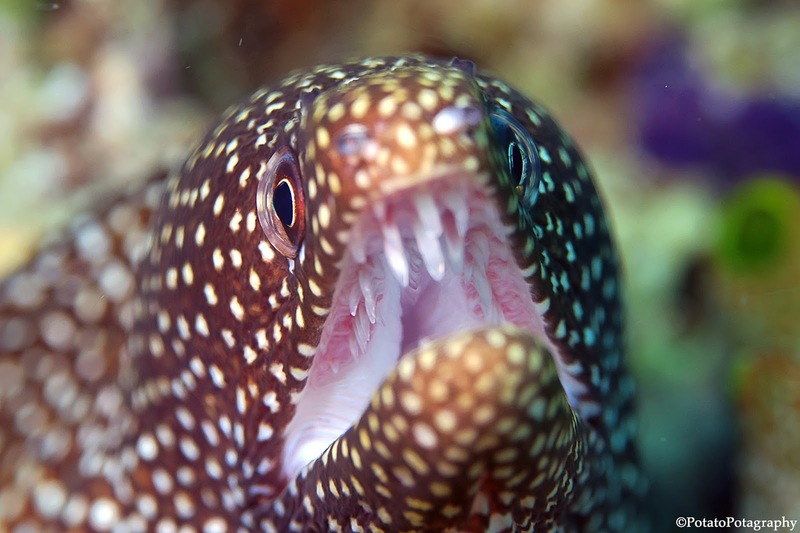 Equipped with pharyngeal jaws, the moray is an imposing predator to the crustaceans, fish, and invertebrates that it seeks as a meal. First it lays in wait, peeking its head from its burrow and sneakily scanning the reef. When spotted it strikes, grasping its prey whole and alive with its first set of outer jaws. Next, it extends its inner jaws, the pharyngeal jaws, to pull its prey down its throat and into its belly, still alive, still whole. Yet, this beady eyed, and bead spotted eel is not at all harmful to humans, preferring to hide from their presence rather than be seen. The moray has also been observed to collaborate with one of its fellow reef dwellers - the coral grouper. Inhabiting different niches, burrows vs. open reef habitat, the coral grouper lives in the open reef water and has no access to the creatures that choose to hide in the crevices of coral, the grouper in turn struggles to catch creatures quickly darting to and fro. Thus this unlikely pair will sometimes team up, the grouper corralling creatures near the moray burrow, while the moray flushes creatures out of nooks and crevices of its home. Trapped from shelter on both sides, the creatures have no escape and the groupers and morays both get an easy meal. Sometimes seen hidden in the cracks of the step reef, or twisted and wrapped around the nooks and crannies of the big brain corals scattered around Pom-Pom Island. The moray resembles a snake from the ages, an underwater serpent of the Slytherin, and something superb to be seen.